The Apttus CPQ tool is a highly complex managed package that installs on the Salesforce.com platform to enable a seamless Configure-Price-Quote solution. Simply installing the managed package is almost never enough though, for our clients to achieve their business goals. Your teams have years or decades of Opportunity, Quote and Account records that allow them to paint a picture of the history behind the relationships you have with your customers. The process of getting from point A to point B in any data migration effort, regardless of what systems are involved, is oftentimes going to look convoluted if you are not migrating data on a regular basis. The data model from one system to the next is rarely similar. You might also have initiatives to increase the level of data quality and/or governance in your organization which will also add to the level of complexity of the effort. Fortunately Statêra has several consultants on staff with many years’ experience doing just this. 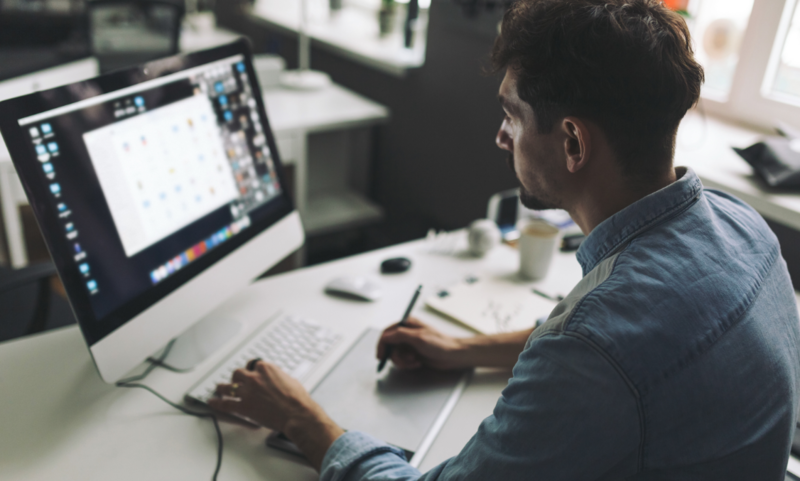 In today’s blog post we would like to guide you through some of the higher-level decision making processes: choosing between migration with configuration and migration without configuration. 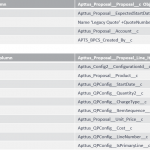 We also take a look at the lower-level exercise of mapping legacy system fields to fields in the new Apttus CPQ instance. The Legacy Quote can be migrated from any legacy system into the Apttus CPQ system in two different ways. 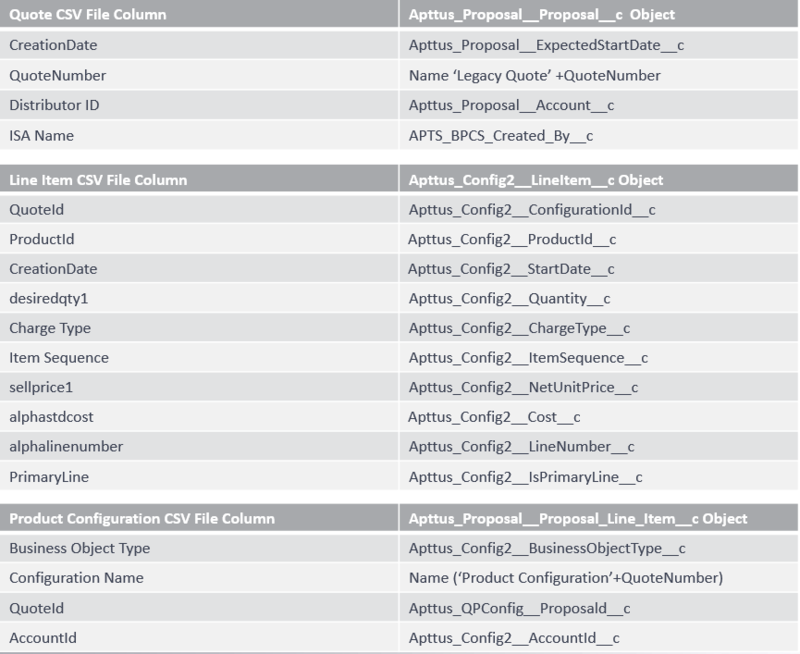 “With Configuration” means loading legacy Quote in to Quote, Product Configuration and Line Item objects. 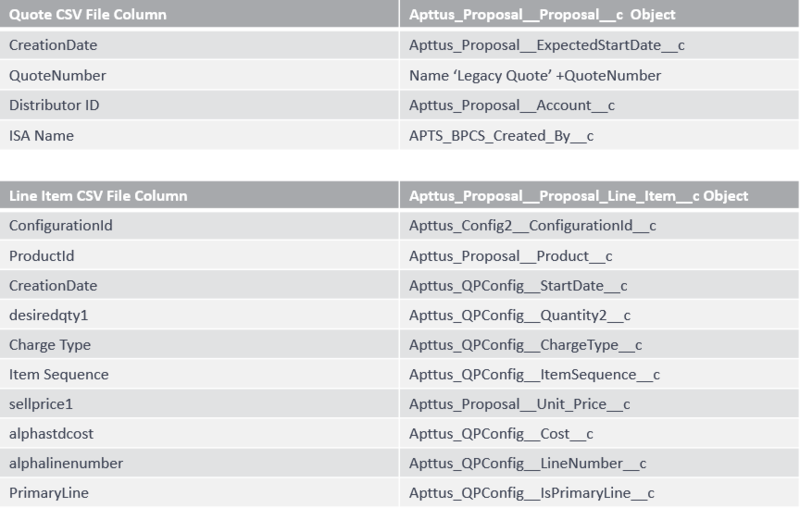 Legacy Open Quotes with lines can be migrated into a Quote/Proposal, Product Configuration Object with accompanying Line Item object records. When migrating into the Line Item object those lines will appear in the Cart (the Proposal stage must be other than “New”), the Cart can be modified, new products can be added to the Cart, and finally the Cart may be finalized. The Quote will function as a normal Cart. “Without Configuration” means loading legacy Quote in to Quote and Proposal Line item objects. Legacy Finalized Quotes with lines can be migrated in to Quote/Proposal Object with accompanying Proposal Line Item object records. 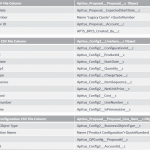 When migrating into Proposal Line items object those lines will not appear on the Cart; however, additional new products can be added and finalized in the Cart. IMPORTANT: the finalization sequence will wipe out the imported data! The recommended use case for this behavior is historical data only. In Real Time Integration, whether you load the first option or the second option, once you finalize any quote record that will create Proposal line item records (option 2), that integration will always take records from Quote and Proposal Line Item objects only. Once the Quote is finalized and approved (Legacy Quote and the New Quote) a SOAP callout made by clicking a button on the Quote record to the Quote Web service that is there on the AS400 server. The SOAP callout will send the Quote and its line items data to the Web service. Once the Quote created in BPCS then the callout response will send the BPCS Quote number along with Success message. If any error then the response will have only the error message. The BPCS Quote number and the Success/Error message are get updated by the apex class in the Quote/Proposal object. All the legacy quote will have the BPCS Quote Number and the integration will update the BPCS Quote Number for the newly created quotes. All the BPCS Quotes will be converted to an Order and a batch process will update the Quote record in Apttus with the Order Number. Once the Order Number is received from BPCS then the Quote is locked for editing. Regardless of whether you are using a Microsoft Access database with thousands of records, that was built in-house 20 years ago by someone who left your company; or if you are using a customized .NET solution with hundreds of thousands of records inputted by hundreds or thousands of different people, the bottom line is this: you want to take advantage of modern technology and you recognize that Apttus is the solution for your sales and business operations teams to take the next step. But you can never take that next step if it isn’t an option for you to bring historical data and insight into the new system. Fortunately Statêra is a leader in consulting you on your Apttus implementation – and we have a stable of resources who have dedicated themselves on a multitude of different scenarios, to achieving client satisfaction when it comes to migrating legacy data and enabling you to use it in concert with the highly powerful Apttus Quote-to-Cash technology.